The 2013 CALEB Conference was held in Brisbane, Australia, on Friday and Saturday last week. The CALEB Conference is a Christian writing conference organised by Omega Writers Inc, an organisation dedicated to supporting Christian writers in Australia, New Zealand and other parts of Australasia. Christian writing conferences are a rare occurrence in my part of the world, and we were blessed to have three Christian publishers in attendance this year. I was unable to attend the Friday sessions due to family commitments. I stayed with family in Brisbane and experienced an early taste of summer with mid-30 degrees celsius temperatures. 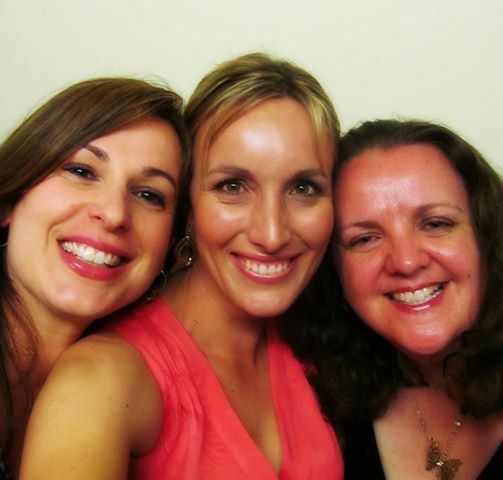 Dorothy Adamek, Catherine Hudson, me. A conference highlight for me was meeting my online friends in person. The fourth annual CALEB Awards Dinner was a wonderful opportunity to catch up with my Aust/NZ writing friends. It was great to see my Aussie writing friend Dorothy Adamek, who also travelled to ACFW in Indy last month, and meet my NZ friends Catherine Hudson and Iola Goulton in person for the first time. I sat next to Rose Dee at the dinner and cheered for her when her Aussie contemporary romance book, A New Resolution, won the CALEB Award for Fiction. 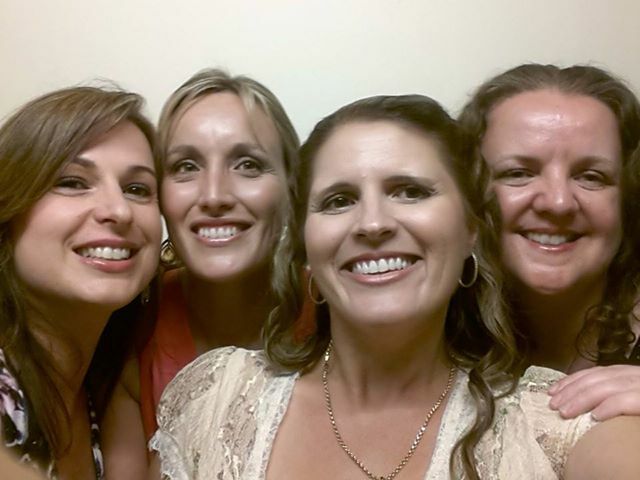 Dorothy Adamek, Catherine Hudson, Rose Dee, me. A number of my group blog friends from Australasian Christian Writers (ACW) and International Christian Fiction Writers attended the conference. ACW blogger Carol Preston won the CALEB Booksellers’ Choice Award for her Australian historical novel, Tangled Secrets. 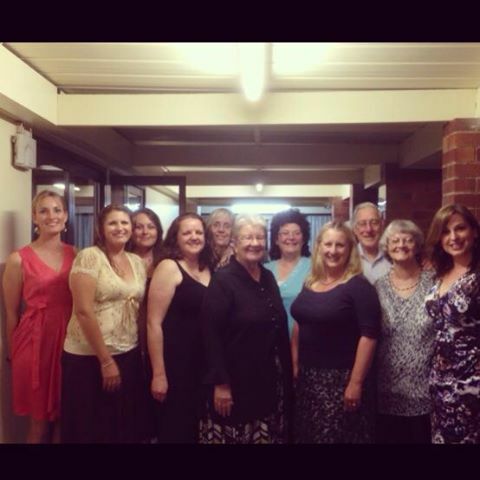 ACW group, Left to Right: Catherine Hudson, Rose Dee, Kerry-Lee Harney, Narelle Atkins, Jo-Anne Berthelsen, Anne Hamilton, Jenny O’Hagan, Iola Goulton, Ray Hawkins, Mary Hawkins, Dorothy Adamek. I participated on two panels at the conference. The first panel was ‘Romancing the Story’ with romance authors Mary Hawkins and Andrea Grigg. We talked about our writing journeys and encouraged participants to ask questions. Mary has mentored both Andrea and I, and we have appreciated her wisdom and guidance. We talked about the faith element in a romance, ranging from a story written from a Christian worldview to a more prominent spiritual story arc. Writers need to show the character’s faith journey and not ‘preach’ their Christian message to the reader. We discussed genre expectations for Christian/inspirational romance and romance reader expectations. The cultural differences between Aust/NZ and other parts of the world give our stories a unique flavour. We looked at the differences between the smaller Aust/NZ market and the larger international market based in North America. We also talked about a recent Australian article that questioned the value of Christian romance, and whether or not the issues brought up by the author had any merit or Biblical foundation. The second panel I participated on was ‘Making the Most of Social Media’ with YA author Michelle Dennis Evans. Michelle’s first indie book, Spiralling Out of Control, releases this week and we discussed how social media can be used to launch and promote books. Websites, personal blogs, group blogs, blog alliance book tours, Facebook, Twitter, Goodreads, Pinterest, LinkedIn and Instagram were platforms we discussed during the session. Michelle talked about the importance of remembering that social media is ‘social’, not ‘spam’ or ‘business’ media. She discussed the value of being strategic and using the platforms that will connect authors with their target audience. I talked about my experiences with group blogs Australasian Christian Writers and International Christian Fiction Writers. I explained how blog alliance book tours worked using the Australian Christian Readers Blog Alliance as an example. Social media is a great way for authors to interact with readers, but authors need to know and follow the etiquette for each platform. We talked about the importance of balance. Writers need to be writing their books and not spending their writing time on social media. Social media has different uses and applications depending on the stage of your writing journey. A conference highlight was the ‘Publishing Today’ panel with Rochelle Manners, George Bryant, and Julie Firmstone. Rochelle Manners is the publisher of imprints Even Before Publishing (fiction and non-fiction) and Wombat Books (children) in Australia. Rochelle is a big supporter of Aust/NZ Christian writers and books. She is a traditional publisher of print and ebooks in both the Christian market and general market (Wombat Books). She is looking to expand further into the international market and a couple of EBP titles will soon be translated into Korean. Rochelle is the founder of Light the Dark online book store and Australian Christian Book Club. George Bryant is the publisher of Daystar Books in New Zealand. Daystar Books is a non-profit subsidy publisher that strives to publish quality books that have not been picked up by a traditional publisher. Daystar shares the costs of producing the book with the author. Julie Firmstone is from Christian Education Publications (CEP), a traditional publisher in Australia. CEP is part of Youth Works Media and is a non-profit ministry organisation that publishes a number of imprints including Growing Faith, Aquila Press, Youthworks Press, Fervr, Blue Bottle Books and Anglican Press Australia. CEP provide syllabuses for Scripture in Schools and their books focus on children, youth, families and Christian living. They don’t publish biographies. CEP are education suppliers and have trade distribution in Australia, New Zealand and the UK. They will soon be distributing books in the USA. Rochelle and Julie talked about the struggles and challenges traditional Christian publishers in Australia need to overcome to survive and stay in business. A number of Australian Christian small presses have folded in recent years. Rochelle encouraged us to support Aust/NZ authors by purchasing books from Aust/NZ booksellers. The Australian Christian book market is small and many authors are making money from speaking engagements. Traditional publishers take on all the financial risk when they acquire a book, and it helps if authors have a platform and the ability to hand sell books to their target market. Julie used the example of it being difficult for an author of Bible Commentaries to sell books unless they are a pastor and have theological credentials. Julie said an 80,000 word Christian living title will typically need 100 hours of editing and 40-60 hours of design time. George is happy to talk with authors about how they can negotiate a unique publishing path. He’s looking for books that inspire, give hope and also books with Christian content that can be marketed to the general market. Daystar Books do not have a goal of making money for the organisation from the books they publish. George wants to partner with authors to help the author make a profit from their financial investment in publishing the book. Marketing is important and a web presence, blogging and social media will help authors build their platforms and sell books. Rochelle does a lot of marketing with her authors and works hard to help them promote and sell books. All three publishers will accept unsolicited manuscripts. Please read the submission guidelines on their websites for more information and to ensure manuscripts are suitable for the targeted imprint. Rochelle receives a large number of submissions each year and occasionally closes to submissions in order to catch up on the back log. Rochelle asked that writers respect the fact that publishers are busy people with a large work load. She wants writers to read the submission guidelines on the website so they know when they can expect to hear a response. Writers are encouraged to follow up their submissions via email if they don’t receive a response within the time frame specified in the submission guidelines. Sounds like it was a great time as I knew it would be for all able to attend. Glad you enjoyed it, Narelle. Thanks for sharing some of it with those of us unable to go. Hi Dale, It was a wonderful conference and a great opportunity for the Aust/NZ Christian writers to network and meet industry professionals. I’m glad my brief notes from a couple of sessions were helpful and I hope you’ll be able to attend a future conference. Fantastic summary of your experience at the conference, Narelle. Thanks for sharing it with us all. Thanks Ian 🙂 One day our schedules will co-ordinate and we will meet in person at a conference! Thanks, Narelle. Although I attended both days of the conference, I didn’t get to attend any of these sessions as they clashed with the two sessions I presented on editing (one was co-presented with the brilliant Anne Hamilton), and with my one-on-one Book Doctor appointments. The highlights for me were meeting face-to-face with authors I have worked with (like Amanda Deed and Michelle Dennis Evans), meeting online friends for the first time (like you and Dorothy) and attending the CALEB Award dinner. Hi Iola, Thanks for sharing your conference highlights 🙂 Your workshop with Anne Hamilton was informative and helpful for new fiction writers. I hope a few more attendees will blog about the different sessions and share their experiences. Thanks, Narelle – now I know a little more of a couple of sessions that I missed. If only we could all be in three places at the same time! It was an excellent conference, highly informative, and very encouraging. Cathie, thanks for stopping by 🙂 It was hard to make a decision on which sessions to attend and I’m glad the info I posted was helpful. Was so good to see you, Narelle. Wish we lived closer, but then maybe we wouldn’t get any work done! Love spending time with you. We are still “on the road’ travelling home in between other appointments so slow to get here to your great blog, Narelle. It was indeed a really excellent time of sharing knowledge and fellowship together. There were still too many other writers I did not manage to spend time with but hopefully next time? Mary, it was wonderful to see you at the conference 🙂 Even at smaller conferences it can be hard to catch up with everyone we want to see. Have fun ‘on the road’ and safe travels home. Thanks for sharing your experiences of the conference. It’s cool to catch a little of what you experienced.